Why have one way to remove stickers when you can have ten? I love reusing containers when I can, but removing the stickers from all those boxes and jars can be a huge pain! Store-bought sticker and gunk removal products are generally pretty effective at removing any leftover sticker gunk, but they can be expensive. And who knows what kind of ingredients are in those things? But the good news is that you can effectively remove stickers and sticker residue using things you probably already have at home! 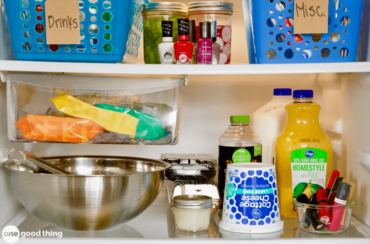 Today I’ll be sharing 10 different household items you can use to help you remove stickers so you can put those containers to good use! The great thing about having 10 different options for removing stickers is that you can use what you have, rather than needing to make a trip to the store. And some methods work better on certain types of stickers, so you may want to try a few different methods if the first one you try doesn’t work out. But before I get to the list, I want to talk about the why they work. The basic principles behind sticker removal are oil, scrubbing, and time. Applying oils or fats to a sticker will soak into the sticker and dissolve the stubborn adhesive. Scrubbing with abrasive ingredients or sponges can be an effective method for sticker removal, too. And finally, time is a big factor too. When using a method where something is applied to the sticker, you need to allow it plenty of time to work its magic (at least 30 minutes, I’d say). Soaking an item with washing soda has been my go-to method of sticker removal for several years now. It’s easy, clean, and you can do several containers at once. You can get all the details on this method at the link below. The fat content in peanut butter is very effective at dissolving sticker adhesive. Just smear a thick layer across the sticker you want to remove, and let it sit for an hour or so. After the wait, you should be able to wipe the sticker and adhesive right off! If you’ve removed the paper part of a sticker but can’t get the adhesive residue off, grab a pencil eraser! The grippy rubber will help drag the adhesive away from the surface, so you can scrape it off more easily. Alcohol is another item that effectively dissolves sticker adhesive. You can use several different alcohol-based products for this purpose, including cheap vodka, rubbing alcohol, and nail polish remover. Soak a paper towel in your alcohol-based product of choice and wrap it around the sticker you want to remove. Let it sit for a half hour or so, then wipe the sticker and adhesive away. This combination packs a powerful punch against stubborn stickers. The coconut oil saturates the paper and adhesive, which loosens it up, and the baking soda helps scrub the mess away. Mix together enough coconut oil and baking soda to create a paste, then smear the paste across the sticker. Let it sit for an hour, then scrub! The fats and oils in mayo make it a tasty condiment, and a surprisingly effective tool for removing stickers! Just spread a thick layer of mayo onto the sticker in question and let it sit for a half hour or so. Wipe or scrub the sticker away. If you’re looking for a manual method for sticker removal, a good old fashioned razor blade does the trick! Hold the blade at an angle and gently push it under the edge of the sticker. Keep pushing until you’ve removed a section, then repeat until the whole sticker is gone. WD-40 has gotten me out of some sticky situations in my life! (Pun intended.) This versatile lubricant can also help remove stubborn stickers. Spray it liberally onto the sticker you want to remove, and let it soak in for a while. The sticker should slide right off! Soak a washcloth in white vinegar, then wrap the cloth around the area where the sticker is. Let it soak for 30 minutes or so, and the sticker should slide off much more easily. Ten Good Things By You! Removing container labels has always worked best for me when I use full strength Citri Solv. Soak container in hot water and remove as much of label as possible. Apply Citri Solve, rub on and let sit for a few minutes, then wash with dish washing liquid and a Scotch Brite pad. Companies use different kinds of glue to attach labels, and I have not found any that this method does not work on. I removed a label recently that pealed off completely after being soaked in hot water. Try pouring white vinegar on and around the sticky part. It should start to loosen! I’ve been receiving your emails for about two weeks and I love all of the handy hints. I only wish they had a printer friendly format so I could save them for easy access. I know I could “Pin” them, but internet service isn’t always available. OneNote is available off-line. Have a blessed day. I used cooking spray oil with success. Im so confused by your comment! Im sorry if Im just not understanding you correctly, but what do you mean when you say, “you can open a reused shoe box to see inside without having to lift a bottle” ?? You open the box and can then read the labels on each bottle CAP, without having to pull each bottle out to see the label on the side. Have a great day! I know you like natural products, GooGone works wonders. Chris. S.